The following greenhouse tips were provided by Sheri George, our guest host from Episode 203: Greenhouses for Year-Round Growing. See also Sheri’s Greenhouse Do’s and Don’ts, and More About Hobby Greenhouses. These tips come from thirteen years of experience… and still learning. Gutters to fill rain barrels (also will help prevent splashing if flowers/crops are planted alongside greenhouse). Shade cloth is essential in summer if greenhouse is situated in full sun. (Vegetables love full sun, but southern full sun in a greenhouse will cook plants.) Many different weaves for desired amount of shade. Keep greenhouse journal. Fun to track high and low temperatures daily for monthly summary. Also write down what seeds were planted, how planted (covered, uncovered…etc) and how long it took to germinate. Will help in deciding what seeds to grow in the future. Propagation mats with thermostat help with successful germination also do not have to depend on heater as much in winter. To prevent pests and disease in greenhouse, DO NOT overwinter plants that have been outside or are already sickly. (People love to ask if they may overwinter their tender plants in greenhouse…learn to say “no”). Water seeds/seedlings from the bottom to prevent damping off. Use a wireless temperature transmitter to keep track of highs and lows…make sure it has an alarm to alert someone that the temperature has gone below desired temperature. Learn what whiteflies and their eggs look like. Very hard to get rid of if they become established in the greenhouse. Check seeds/seedlings several times/day. Make sure the greenhouse is not too hot or too cold, seedlings not too dry or too wet…sort of like the story Goldilocks and the Three Bears…needs to be “just right” for optimal success. When cold, use warm water to water as very cold water will shock the seedlings and slow growth. Use diluted fertilizer to feed seedlings. Full strength will “burn” roots. Most importantly, have fun and smile with the joy of growing plants. Hi. The only place I could put a greenhouse would be my backyard. It would have very limited sun because of a huge oak that keeps the majority of the backyard in shade year round. Can you supplement with full spectrum lights? I have used a light meter in the yard and a few small areas get 4 to 6 hours a day in the summer. One spot, 2 x 2 feet, gets 8 to 9 hours of sun during the summer. I would really like to build one. I wish I could remove the oak, but it would cost a fortune. The oak would be replaced with several dozen fruit trees, so I would feel okay about taking it down. yes, full-spectrum LED lights of the proper intensity can work wonders for supplementing or providing the light needed for growing many plants. You’ll need to do your homework though as to how much output you’ll need for what you are trying to grow. Good luck Bill. My husband bought me a Greenhouse for Chriistmasl,we had a really bad wind and it was a disaster.We mow have it fixed and I am starting to put seeds in small pea pods,whats a goodtempature should it be? Judy, Sorry to hear about your greenhouse but glad you were able to salvage it. If you are starting seeds, whether in your greenhouse or indoors, the optimal soil temperature is 70-80 degrees F. I recommend you listen to Joe’s podcast or read the notes about starting seeds. It’s a three part series with lots of great information. Here is the link for the first one.https://joegardener.com/podcast/037-starting-seeds-indoors-pt-1/ I hope this helps. Happy gardening! What if you don’t want to sell plants and just sell produce? Is planting in the ground ok for that? I am learning how to greenhouse because I’ll be selling produce year round and need to know the best tips and everything i need for that. How to grow the veggies that die in the winter outside in the green house?? Do u need temperature in greenhouse to stay at a level so that plants don’t die or get to hot, how do u set that up in the green house. I need to k ow alot of stuff to help me in the future when planting and how to keep crops from dieing and everything about greenhousing to have veggies year round and maybe planting flowers in containers to sell to people. I need to know everything about that. Hey! Thanks for sharing this new concept in greenhouse cultivation of crops. This idea will help a lot of people those who are unable to focus completely on their garden. Will be waiting for more updates from you. Thanks for sharing this information! I have a collection of about 150 orchids and recently moved to Cold Spring, NY. I’ve grown orchids under a variety of conditions, but now I’m in a situation where I can actually build a greenhouse. The other spot is in full sun, but it is very far from the house (at least 300 feet) and I can’t see it from the house. I would have to put really long water and electric lines out to the greenhouse and in the winter months when it is snowy and icy it would be a distance to get out there. Plus it’s a far walk to carry blooming orchids from the greenhouse to the house. *Is it okay if the greenhouse if it gets a lot of shade in the winter? *Is it better to build in full sun but have a greenhouse far from the house? This is an interesting question Jessica. I’m assuming your greenhouse would be under a lot of evergreens if it’s still shady in winter? One thought about having a greenhouse that is far from the house; I do know that convenience is very important in the practical sense for gardening. The less convenient it is, especially in winter, the less likely you might be to get to your greenhouse enough. But if you just need a warm place to park your plants, this may be a good way to go. I’ll be interested to see what others say about this. I have a question, that I’m hoping you can help me with. I recently purchased raw property in the San Luis valley of Colorado. I currently live in the pan handle of Texas, about 6 hours away. I would like to start establishing new growth in the area as the land is pretty sandy. My plan is to build a high tunnel greenhouse there and one here. Start growing trees and shrubs here to eventually transplant there. Giving me time to recondition the soil there. I have plenty of land in both areas. I am hoping that you could give me a few suggestions on the different trees, shrubs, plants, etc that can take the shock of the different climates and soil conditions. Especially, when I will have to leave the ones in Colorado alone for extended periods of time, until I get established there. Hi Robert. This is outside my scope of expertise since you’re wanting to know about local plants/trees. I’m in Atlanta and I am not the most qualified person to take that on. Your county extension service would either be the best source, or they could point you in the right direction. Good luck! Sheri George mentions a wireless temp alarm, since we have about 200 orchids in our hobby. Greenhouse, a remote temp alarm would be useful. We love your show and watch it every Sat. Morning on WCVE in Richmond. Hi George. I’m passing your question on to Sherry to get her advice on this. Stay tuned. And thanks for being a faithful viewer! I have used Oregon Scientific brand with my greenhouse and have only had to replace batteries so it is the only wireless temperature gauge with low temperature alarm I can recommend. There are several other brands that I am sure work well. When it is time to get a new wireless device, I believe I will look for once that transmits humidity too…which as an orchid grower, you might look for too. Happy “Greenhousing”…one of the happiest places on earth. I have heard of this. Also a string of Christmas tree lights close enough to the plants to keep them warmer. That seems to be a good way to “spread the warmth” vs. larger lightbulbs. But, these days the challenge is in finding those strands of lights that still have the bulbs that put out heat. Now most are LED and cool to the touch. Good luck Diane. I have access to a great greenhouse built by the usda in the 1920s. The property was a usda experimental station and is now an industrial park. Thankfully the greenhouse is still intact and operational. Currently one of the parks businesses is using it to rotate office plants. The COO happens to be my boyfriend and is a fellow gardener. We’ve been cleaning it up and getting it organized and now have a good bit of extra room. We live in Mississippi and frequently plant fall gardens outdoors – using row covers when needed. But now we are thinking about taking it a step further and grow even more crops by using the greenhouse. My question is will we need to suppliment lighting once the days grow shorter? The greenhouse is already equipped with a heater and electric ventilation. But only a dozen or so regular light bulb sockets. For office plants long days of light aren’t cruitial. But we want to grow food. What do you recommend? Hi Shannon. The short answer is I can’t answer this one from personal experience. But I will say that from what I know, if you’re trying to grow food crops through the cool season, if you stick with leave crops typical of classic cool season edibles, I don’t think you’ll need supplemental lighting. That issue becomes more important if you are growing fruiting crops beyond summer. They you would def. need supplemental lighting and adequate heat. But from what you say, I think you will be OK.
As an example, Eliot Coleman, cool-season organic gardener extrodinaire grow year round in high tunnels with no supplemental lighting. And yes, he’s growing a lot of spinach and leafy greens but if he can do it in Maine with two layers of poly, you can do it with what you have in MS! Please let me know how it works out. Good luck! The ideal place for me to have a greenhouse is on west side of my Brick house. Would that be too much sun and too hot? My greenhouse leans on to our metal barn. It faces south so we added foam insulation to the back wall to prevent the greenhouse from getting too cold in the winter due to the metal barn wall. The foam insulation had a shiny side that we installed towards the inside of the barn. We had to peel off the shiny side because it reflected too much light. Now we have the white foam. We’re thinking about painting the foam but we’re not sure what color would be best. What would you suggest? What percentage coverage should my shade cloth be? I have 50% but my plants grew spindly. I grow vegetables and I live in Portland, Oregon. I was not able to find the answers I need in the web. Please help. Hi Diana. I don’t know the answer but I’m posting your question here in hopes that someone else does and will chime in here. Thanks. Is an evaporative cooler effective to cool down a greenhouse in the summer? I have a 20×20 wirh exhaust fan and shade cloth, but it still gets to be over 100 especially when outside temps are in the 90’s. As the temp rises in the GH, the humidity drops. With low humidity, will the evaporative cooler work? YES, Evaporative coolers use evaporation to cool air and in effect add humidity to the air. Think of sweat, as air flows across your skin sweat evaporates and cools your body. Humid air make it harder for that to happen vs dry air. That’s why very humid vs dryer climates ‘feel’ warmer even at the same temps. here’s the long answer. Think of air like a sponge, when its hot its a big sponge that is able to hold lots of water, when its cold its like squeezing the sponge. Depending how much you squeeze it will determine how much water it can hold before it starts to drip, thats 100% Relative humidity. Relative Humidity is the amount humidity(water vapor) air can hold relative to the temperature. When air is cooled its like squeezing the sponge and now the amount of water vapor the air can hold at a lower temper is less. So at 100% relative humidity 70 degree air has less water vapor than 90 degree air at 100% relative humidity. As warm air is cooled the RH rises until it reaches the dew point, that is when air reaches past 100% relative humidity and can no longer hold water vapor so it condenses back to liquid. This happens by cooling humid air thus reducing the point at which it reaches 100% RH. Its how a cold front makes it rain. Turned my porch into a greenhouse (many windows), hoping to get started soon. Thank you for the insight!! I really enjoyed reading all the post and have a question for you. I live in Ft. Lauderdale, FL and am ready to start an organic vegetable garden using grow bags. I have been looking into a portable greenhouse (ebay has a great selection) I am wondering if the south Florida summer will be too hot? I can put a greenhouse closer to the house so it would be shaded from direct sunlight at 2pm. I had started 1 tomato plant that was ruined by bugs so I thought a greenhouse would solve the bug issue. I read the article about using shade cloth and also wonder if the green house is only getting full sun until 2pm if I need to still use shade cloth? Florida heat can be deadly to plants confined to a greenhouse in full sun. Although a greenhouse is ideally suited to warm the growing environment in cooler climates, you may just need shade cloth as I don’t think you want to make it warmer. Have you contacted your local county extension service? They are really good with offering local growing tips that speak to your specific challenges, especially with heat and managing pests responsibly. Hope that helps. I have a greenhouse and have not been very successful in growing anything. I live in the Black Hills of South Dakota where the growing season is very short compared to other parts of the USA. I am in the process of preparing it for the tomatoes I started my indoor greenhouse. I’m thinking of adding some fresh dirt and compost. We do compost egg shells-coffee grounds -fruits and vegetables. Anything else I should do? I would make sure you used a high quality soil mix for containers. It may also be listed as potting mix. But good drainage is key. Indoor growing environments can be tricky. In addition to adequate sunlight or supplemental lighting, you need constant air circulation. If you don’t already have a fan moving air through your greenhouse, consider adding one asap. Otherwise, the trapped humidity common in a greenhouse can promote diseases. A fan will help with that. I also live in South Dakota and am starting my greenhouse this fall. 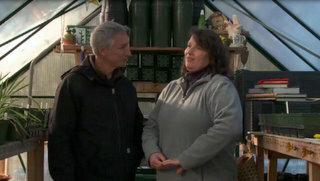 Just curious to know if you are heating your greenhouse over the winter and if so, what kind of heater are you using? This is my first year using a green house. The weather here in SETexas has been ranging from 40deg on the evening to as high as 75-80 in the after noon with full sun. This afternoon I fear I’ve cooked my seeds. I started them in seed trays 2 days ago. When I went to water around 12 as I usually do it was so hot I freaked out and watered them. Did I steam them to death? Hi Lauren. So you tell us,did you steam them to death? I live in South Central Texas and have been using portable covers over raised vegetable beds for many years to extend growth into the winter. Since temps raise quickly here, on most days I had to open the ends of the covers up before work and my wife had to completely remove the covers before 10 am to keep the plants from overheating. Yours probably overheated. I recentLy built my first greenhouse I live in pa and was debating on the best way to heat in the winter months do they make solar powered heaters for ghs or is there other sources too consider? Thanks for any helpful ideas. My greenhouse in Pittsburgh was heated with natural gas. It was a lean-to against the house and was 10 x16 ft. Not nearly as expensive as I initially thought it would be. As an engineer, I think a solar powered heater in the Pa atmosphere with the lack of sun in the winter thus requiring an electric heater for suplimental heat would become unduly expensive. Propane heating is a good option if natural gas is not available. Sue, in SW Florida, there are so many things you can grow, the sky’s the limit. I grew up in Miami and fell in love with gardening because I could grow almost anything in my greenhouse or outside. In fact, the beauty of living in FL is that you’re able to grow things that can’t be grown year round further north. For the most part, greenhouses are used to create an ideal growing environment to keep plants warm enough, and with sufficient light. So warmth should be a problem for you, except in unusually cold days of winter. I would not worry about something blocking the north-facing windows. If you have east and south facing exposure, those are the most important. As for the fumes, I don’t think they would be a real problem from one mower. I assume there is ventilation of some sort in your greenhouse. That should suffice. Have my greenhouse up ready to plant but can not get temp. down to hot in greenhouse. Have a heat and air unit but not bring heat down. What else do I need to do???? I have recently became the proud owner of a greenhouse. Thank you to my wonderful husband. Im so excited as well as clueless. What are the biggest do and donts. What are some good books to read. Any helpful words of wisdom would be greatly appreciated. Thank you Lisa for your kind words. We believe gardening is as much about the mistakes as the successes. The best gardeners got the way they are because the weren’t afraid to get started, even if that meant making some mistakes. In fact the only time mistakes and challenges are bad is if you don’t do anything to learn from them or apply the information to improve going forward. Having a greenhouse of my own is still an unrealized dream that I hope to see come true soon. There are so many resources and people today that are available to make your journey less daunting and more successful. Go for it Lisa. And best of luck to you! i am starting MY OWN green house, but i have learn idea in which to start. when i already obtain a design AS WELL AS learn How you can create it, but we don’t know what to have in order to delivery growing crops year around. we really want in order to stick inside That IN ADDITION TO not provide That up. Please help. I am starting my own green house, but I have know idea where to start. I already have a design and know how to build it, but i don’t know what to get to start growing crops year around. I really want to stick with it and not give it up. Please help. what do you recomend for whitefli? The word “whitefly” is the scariest word when you own a greenhouse! Especially if you are an organic gardener as it takes a bit more diligence to get rid of them…of course the first step to controlling whiteflies is to not invite them into your greenhouse to begin with. It is hard to turn down a friend’s request to “baby sit” one of their special plants in your greenhouse or bringing in plants that have been outside or in another greenhouse but you must. Luckily I have had them only once…when I broke my own rule and was able to contain the outbreak to just a few plants by removing the infected plant, squishing them and then using insecticidal soap. Either way you have to get them when they are not active early in the morning or at night when it is cooler. They are found on the underside of the leaves and are notorious for finding hiding places where they don’t get contact with the insecticidal soap and will continue to lay eggs. You must keep spraying every three or four days and then keep a close eye on all the plants in the greenhouse. Do not spray when it is above 80 degrees in the greenhouse or you may burn the plants. Also, I would be cautious to use on young seedlings though I do not know for sure they would be damaged. Using a yellow card spread with Vaseline can help monitor whiteflies (and fungus gnats) as they are attracted to the color yellow. There are stronger chemicals available including soil drenches (Marathon comes to mind) but in the greenhouse industry the whiteflies are becoming immune to some of the chemicals. Hope this helps and wish everyone a whitefly free greenhouse experience!